Informative Video for Komatsu 930E Large Off-Highway Truck Assembly - Manufactured by Komatsu America Corp.
Video for Komatsu Autonomous Mining Truck Prototype World Premiere at MINExpo 2016 - Overview & Walkaround. Free Download Catalogue for Komatsu 930E-4SE Mining Truck (Electric Drive Truck) Specifications in PDF and Full. 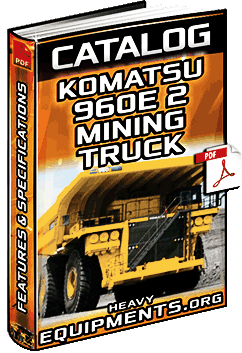 Free Download Catalogue for Komatsu 830E-AC Mining Truck (Electric Drive Truck) Specifications in PDF and Full. Free Download Catalogue for Komatsu HD1500-7 Mining Truck (Off-Highway Truck) Specifications in PDF and Complete.